The pearls are, for lack of a better term, cute. 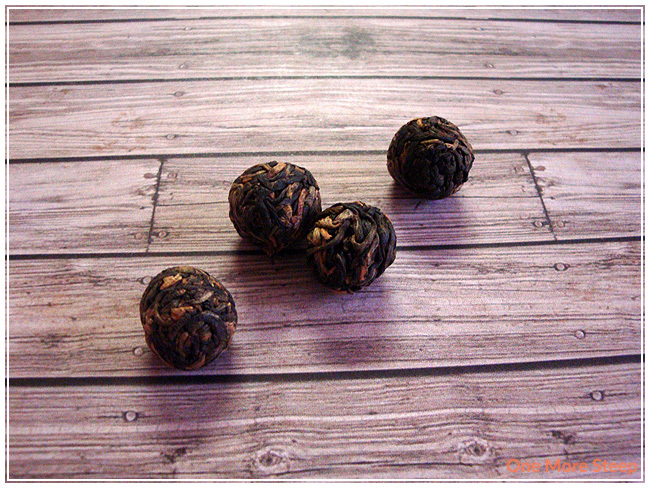 They’re about the size of marbles, a nice mix of light and dark brown tea leaves and they are quite tightly rolled. The Black Jasmine Pearls are certified organic and have a very mild floral scent from the jasmine. It isn’t overwhelming or the first thing I notice, as the black tea base is much stronger in fragrance than the addition of jasmine to the tea. The ingredients for Black Jasmine Pearls are black tea pearls from Hunnan Province, China, that are scented with jasmine blossoms. DavidsTea recommends steeping these tea pearls in 96°C (204°F) water for 4 to 7 minutes. For my tea pot, I used 4 pearls that I steeped for about 4 minutes. 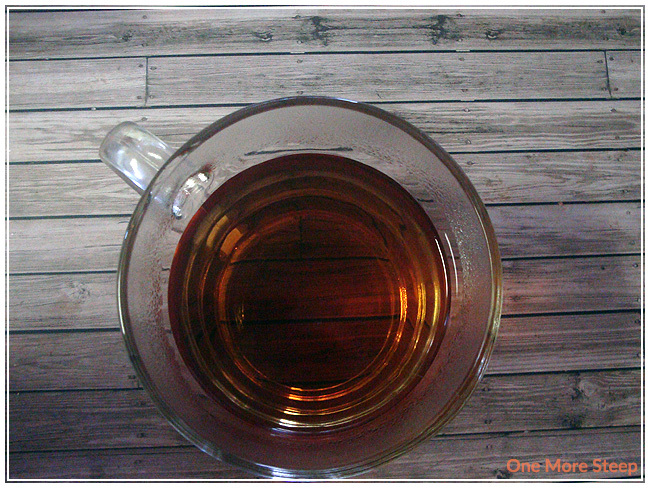 Black Jasmine Pearls steep to a deep golden brown colour, it’s fun to watch the tea leaves unfurl in the metal basket that my teapot has. The overall taste to the tea is a bit underwhelming. It has a bit of a malty taste that I find pleasant. There is no astringency and no bitterness. Despite being called a jasmine tea, there aren’t any obvious floral flavours in the tea itself, which is a disappointing given the fact that it is meant to be a jasmine black tea. It is a pleasant tea, but it’s underwhelming in what I would have expected from a tea that isn’t exactly inexpensive. I steeped the Black Jasmine Pearls for a second time, to see if the flavours would improve. I steeped it for about 5 minutes this time around. Black Jasmine Pearls actually tastes better in steep #2. The malty taste of the black tea base is more pronounced, still no jasmine flavour to speak of, but it’s very enjoyable. The tea is very smooth and pleasant. It tastes really nice. The tea did well for steep #3 and was a bit watery and thin in flavour for steep #4. 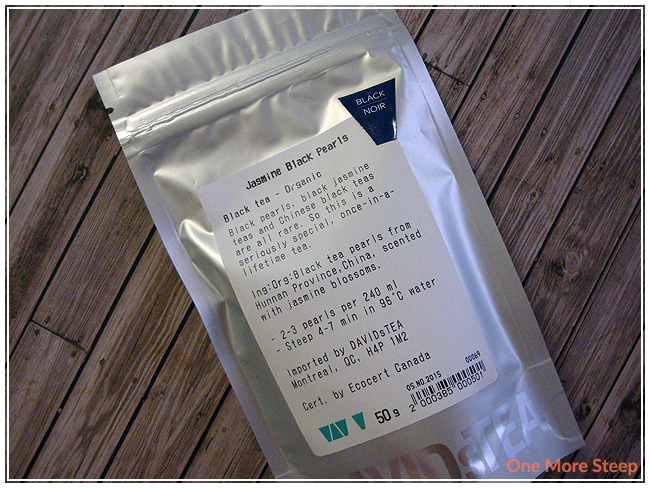 I liked DavidsTea’s Black Jasmine Pearls. While the tea was disappointing in that the jasmine was nowhere to be found when steeping the tea – and to be fair it was fairly underwhelming with the dry tea, the tea itself is enjoyable and pleasant. Black Jasmine Pearls does very well for resteeping at least two additional times, your mileage may vary for the fourth steep. I think it’s a really nice black tea. What it lacks in floral flavouring, it makes up for in the quality of the black tea. It is a bit on the expensive side at $16.90 for 50g, but I think it’s a really nice addition to my tea collection and I do see it as a tea as I’d like to get again (either as a small bag as a treat for myself, or to use my Frequent Steeper reward on).